Four years ago, Earlene Franklin drove trucks on the North Slope. It was a good job, she said: It provided for her six children, and it was going to pay for a new house. She’d just signed the papers. Then came a round of layoffs, and her world turned upside down. While Franklin scrambled to find another full-time job, she said she turned to dividends and savings and part-time work to pay the bills. But in Anchorage, where the cost of living is one of the highest in the country, it was hard to keep up. In 2018, Franklin lost her house. For a while, she said, the family moved between hotels, shelters, and a friend’s home. Then, last fall, they moved into a unit at Safe Harbor Muldoon, a transitional housing program for families with children. It marked an end to a long season of instability, Franklin said. But the future of the program is now in jeopardy. Gov. 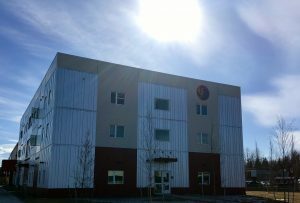 Mike Dunleavy’s state budget proposal would cut several state grant programs that provide “essential” funding for Safe Harbor and other transitional housing options in the state. Dunleavy said the budget cuts are necessary to “right-size” government, match expenditures with existing revenues and preserve the state’s savings. It would cut grant funding to 14 safety net organizations, which stand to lose nearly $5 million in total funding if the governor’s plan goes through. Administrators at Rural CAP, the nonprofit that operates Safe Harbor, said the proposed cuts could force them to close down by this summer. “If we shut down our doors, with the new fiscal plan, we would be putting approximately 140 people back on the streets,” said Safe Harbor supervisor Claudia Maria-Mateo. Residents include 77 children and 63 adults, she said. There are also 11 families on the waitlist, and many, many more still in need. Maria-Mateo said they come from a wide variety of backgrounds. Many were hit hard by the recent recession. Administrators say operating Safe Harbor costs about $6 per person per day: Residents pay some of that cost themselves, some of it comes through Medicaid and other sources and about half of it comes through the state. Without that state funding, according to RuralCAP administrators, Safe Harbor wouldn’t exist. Maria-Mateo said its loss would affect hundreds of Alaskans. “I would hate for the other 182 families that we haven’t reached out in the community — they’re out there living in tents or in vehicles or camping, now that the summer — to not have the opportunity to have this place to stabilize,” she said. The average stay at Safe Harbor is 7 months, according to administrators. After arriving with her family in the fall, Earlene Franklin is driving trucks again, and she’s beginning to look for another place — one that’s big enough for her family and close to her kids’ schools, she said. In Anchorage’s tight housing market, it’s not easy, she said. But Safe Harbor is helping with the transition. It provides more than housing: It also offers community support and stability, Franklin said. And stability is so important; especially for kids facing homelessness.